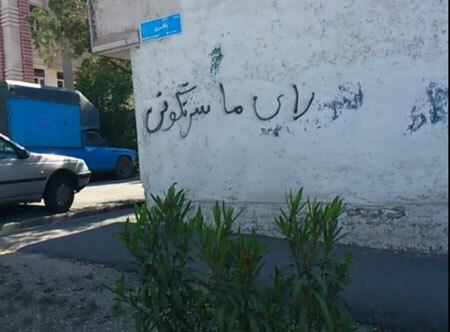 INU- Anti-regime graffiti, posters and leaflets are appearing across Iran sharply ahead of the June sham presidential election. Slogans criticizing the elitist rulers being spread by supporters of the People's Mojahedin Organization of Iran are appearing across cities in public paths, subway stations, parks, and pedestrian bridges. Many read 'Vote to overthrow the regime', 'Spoil the mullahs’ elections', 'Down with the principle of Velayat Faqieh', 'Viva National Liberation Army of Iran', 'Down with Khamenei, Viva Rajavi' and 'Our president is Maryam Rajavi'. The activities are continuing despite intensive security measures in place to avoid a repeat of the massive public uprisings during the 2009 election.